A collector’s edition of a pant-tastic classic – even wedgier than ever! This special edition features a fabulous lenticular cover and a CD with songs, games and extra cool bonus STUFF! There are three new lunch ladies at George and Harold’s school, and there’s something not quite right about them… not to mention their new menu of Zombie-Nerd Milkshakes and Boston Baked Boogers. That’s because they’re INCREDIBLY EVIL TENTACLED ALIENS in school cafeteria lady disguise! 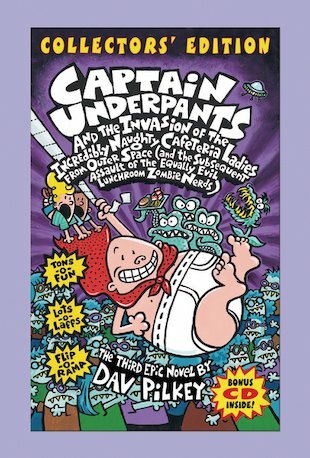 Thank heavens for Captain Underpants. He defeated the diabolical Dr Nappy. He terminated the terrible talking toilets. But does Captain Underpants have the wedgie-power to take on three power-mad space aliens and their zombie legions… and do battle with the Giant Man-Eating Dandelion of Doom? Really funny lol with a great story for boys and girls! Must have.